Lupin is with Goemon and Jigen in their residence when they reminisce about an adventure they had when Lupin wore the red jacket. Back then, they went after what was known as the Pablo Collection. Pablo was a drug kingpin, but hadn’t been seen in years. 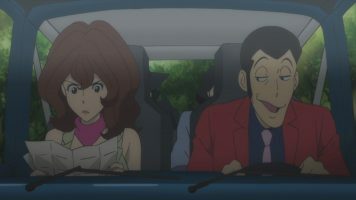 With Fujiko in tow, Lupin and company head to South America, taking a cramped car into the jungle to avoid the gunboats patrolling the waterways. They set up camp, where some of Pablo’s people attack, coming for Pablo’s fortune. Lupin and company lose their car in the attack, but fend off their attackers. After they traverse the jungle for a while, Goemon finds a cave. Within it, they eventually find a giant door. Within it, they find a large collection of very expensive, pristine cars. One of the cars from the 1930s starts and charges at Lupin. Jigen fires at the tires, but nothing happens. Goemon tries slicing the car, but nothing happens. Lupin jumps into a Lamborghini and gives chase through the jungle on a track that spells Pablo’s name. Lupin wins the race against Pablo, but upon winning, both cars suddenly turn into rust buckets fit only for scrap. Pablo’s skeleton is in the other car. The group come under fire from shells fired from a gunboat. They retreat to the cavern where the other cars also appear in poor condition. Their only means of escape is a mini-sub that can hold a max of three people. 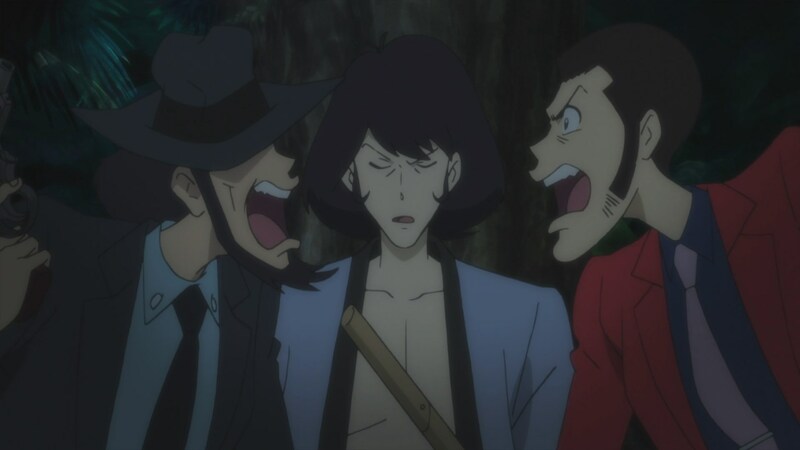 Lupin leaves to pee, but is joined by Goemon and Jigen to fend off attacks. 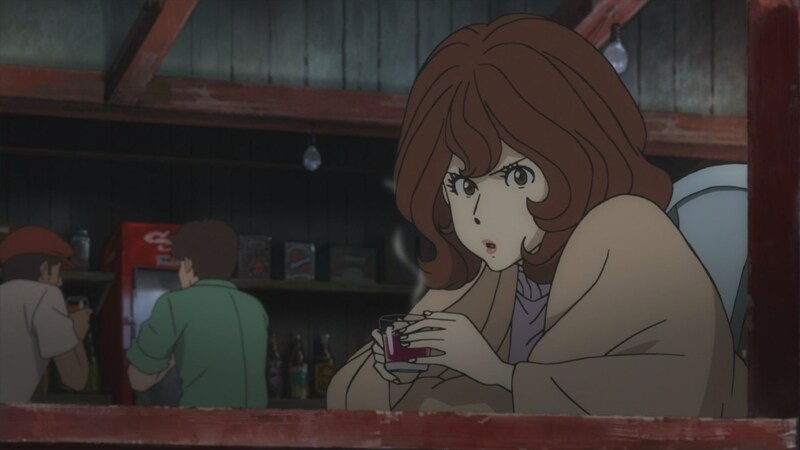 Fujiko escapes in the sub, but it soon springs water, leaving her frustrated that Lupin chose his friends over her. 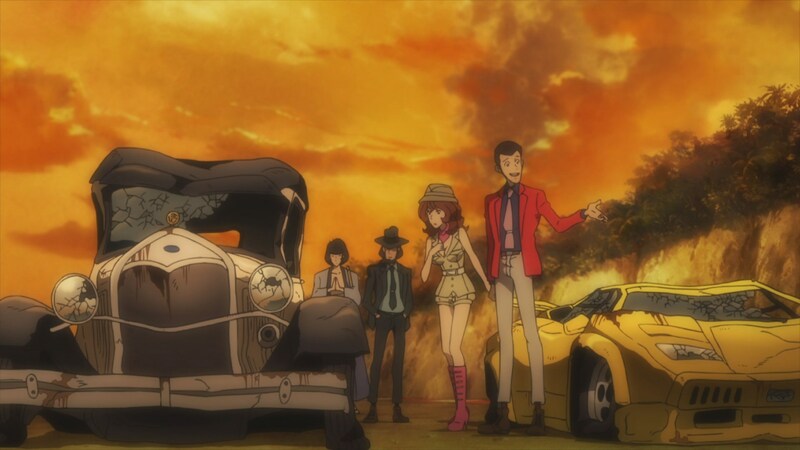 Lupin the Third Part 5 – 11 is another tribute to Lupin of the past. Thankfully, it is a fun one. 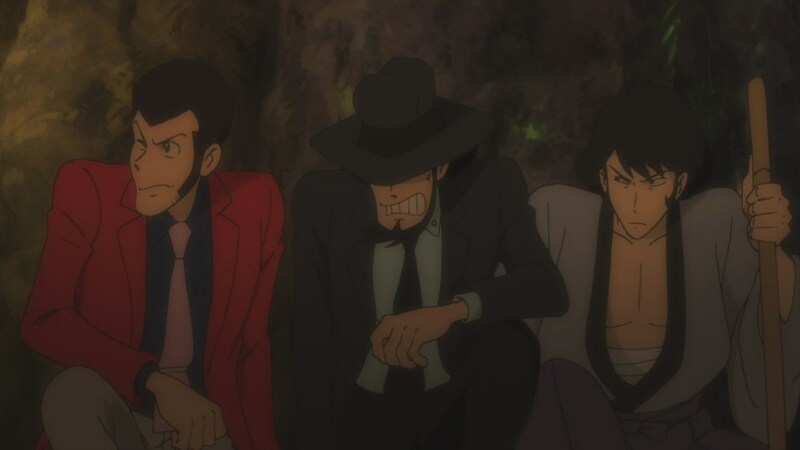 One thing I liked about the presentation of Lupin the Third Part 5 – 11 is that it was clearly done as a flashback. When this series did a Pink Jacket tribute in episode 6, it was done as if it were a lost episode. That was OK, but I much preferred seeing Lupin, Jigen, and Goemon reminiscing and even teasing each other at the end of things. It was nice having Fujiko with the gang and doing the things she usually did. 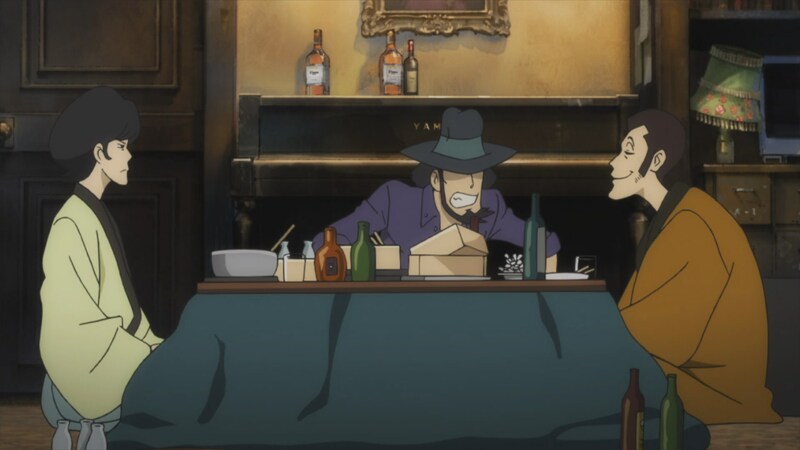 It was a nice reminder of how the relationship used to be between Fujiko and Lupin. Hopefully, that plot thread will be touched on in the next story chapter. 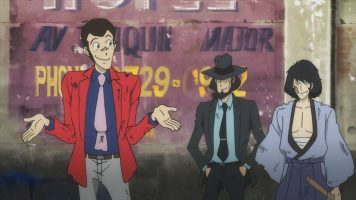 Lupin the Third Part 5 – 11 also reminded us that there has always been a supernatural element to the Lupin III franchise. It is kind of a shame that the story didn’t explore this a bit more. I mean, why would Pablo arrange for himself to have a race with Lupin after Pablo had been dead for years? But I suspect it is best not to think to much on this. Since there’s not a whole lot to Lupin the Third Part 5 – 11, I’m going to go ahead and wrap up my review. Again, Zenigata is missing from this episode. I don’t think he’s ever been gone from the series for such a long time. Sounds like he’s back for the next story. 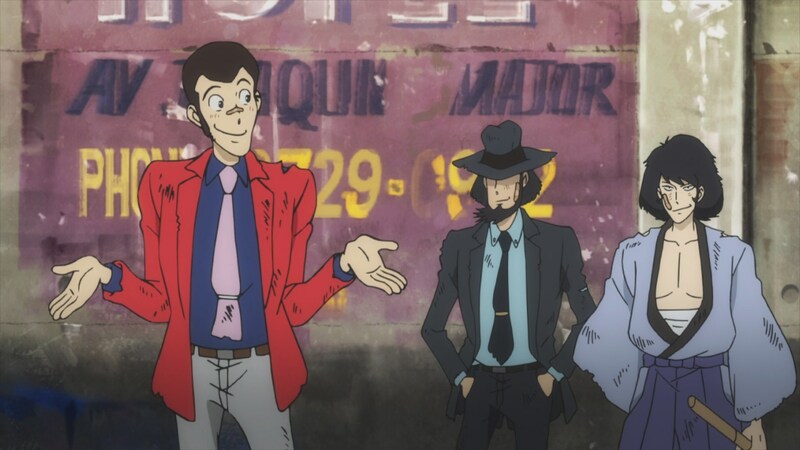 In the end, Lupin the Third Part 5 – 11 is a fun episode that makes for a nice tribute to the Red Jacket Lupin III Part 2 series. I am curious, how much of the red jacket episodes of the second series have you watched ? I used to own all of the Pioneer DVDs from back in the day, and I watched the entire series by marathoning it at the job I had at the time (if I recall correctly, I had to go to fansubs to get the whole series). Sadly, I don’t remember a lot, save for some Miyazaki episodes. Personally, my favorite episode was The Miami Bank Raid Anniversary which was animated by Telecom Film. 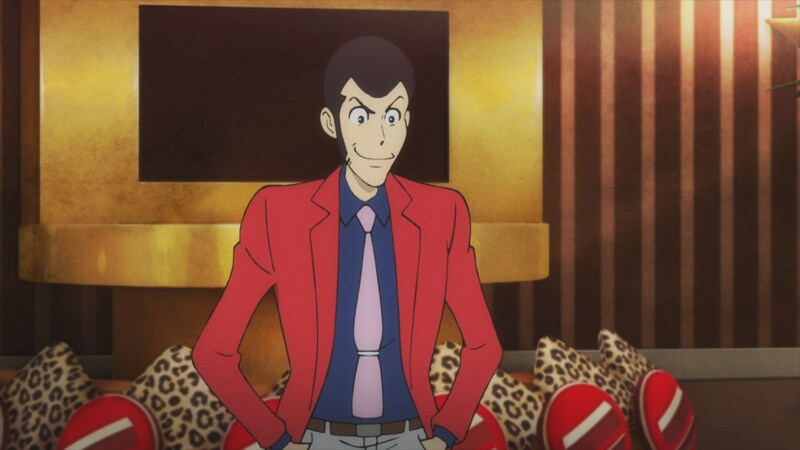 The episode was a great satire of America’s celebrity obsessed culture and one could argue that Lupin lost in the end. I saw a couple of screenshots that seemed familiar to me, but I don’t actually remember the episode. It’s a great story. Lupin is invited to steal the money of the Miami Bank by the Bank’s President in order to generate publicity. There was a perfect balance between humor and good story telling.